Adria launched the ‘crossover’ Matrix range in 2010, aiming to marry the spaciousness of an overcab ’van with the practicality and convenience of a low-profile. This was achieved by positioning the raised front bed halfway over the cab and the lounge, moving the ‘hump’ further back to give a more aerodynamic shape. Matrix is available in three trim levels across two base vehicles. Axess and Plus favour the Fiat Ducato, while the top-tier Supreme opts for the less-common Renault Master. Aficionados of the Ducato may be disappointed that they can’t have the Supreme specification riding on a Fiat but, as we’ll see, the Master does not hide in the shadow of the Ducato. On paper, the Matrix Supreme is a tempting proposition: a capable tourer that packs a lot in on an overall length of 7.82m. Two layouts are available: the fixed twin-single beds SLT and the rear-island-bed SBC, on test here. Both offer extra berths in the lounge for occasional visitors. The Adria Matrix Supreme 687 SBC costs £60,090 OTR, £66,571 as tested. Redesigned for the 2015 season to integrate fully with changes to both base vehicles, Matrix models certainly look distinctive – and the Supreme even more so. Because its base vehicle is an unusual sight on UK pitches, the 687 SBC is a head-turner. The Master’s visual styling includes large vertical light clusters atop daytime running lights, bookending a sculpted front grille with a large inset silver diamond. The metallic silver of the cab is picked up in a silver swoop on the habitation body, supported by black and red stripes, and carried to the rear of the ’van along the side skirts. The low hump over the lounge accentuates the sweep of the aerodynamic moulding above the cab, which features a sunroof. One of the design changes for 2015 is the raising of the roof behind the lounge by 6cm, to increase headroom in the rear bedroom. The habitation door – on the UK offside – has been widened by 10cm, to 60cm. Standing low to the ground, the 687 SBC doesn’t need an entrance step. Inside, living space is on three levels, with steps into the lounge, washroom and bedroom. The Adria Matrix Supreme 687 SBC is supplied with a 2.3-litre twin-turbo engine that produces 165bhp. With an MPTLM of 3800kg, there is always plenty of grunt available. 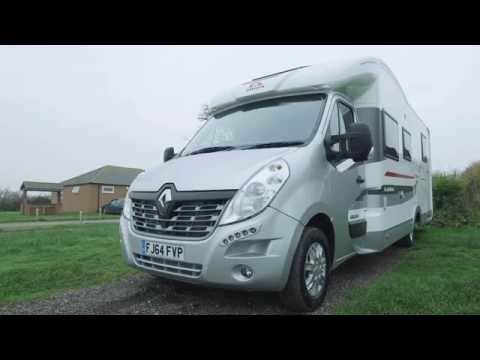 Our road-testers found the Renault Master to be an accomplished base vehicle. Standard driver aids include power steering, cruise control, ESC with hill hold and a gear-change indicator to promote optimum fuel economy. The handbrake is to the left of the driver’s seat, which has a retractable action to allow the seat to be rotated. Forwards and side visibility from the cab is good and a reversing camera fitted to our test 7.82m-long ’van offered reassurance while manoeuvring. On a 150-mile run and loaded with kit for a family of four, the 687 SBC returned 23.87mpg. On the return journey, with Renault’s ECO mode selected and using Stop/Start during a long motorway crawl, the figure improved to 30.46mpg. The system works very well, with no lag between depressing the clutch pedal and the engine starting. The 687 SBC is a pleasant drive, with the adjustable low-profile cab seats making one tester’s four-hour journey surprisingly fatigue-free. Entertainment played a part in this, too; the optional Bluetooth and USB connectivity boosting the radio and CD offering. Behind the cab are three belted travel seats: two side by side on the front dinette bench seat, plus an optional belt on the single sofa. With a body width just shy of 2.3m, the Adria Matrix Supreme 687 SBC has a spacious lounge that can accommodate up to six people in comfort. The sliding lounge table is sited on the nearside and can be moved into position by the seated group. This follows the conventional L-shaped Continental configuration, plus a single sofa on the offside and rotating cab seats. All seating has good support. The ambience is pleasing, with quality cabinetwork and beige-coloured bulkheads and mouldings. European-style nets feature in place of curtains, while the side windows get roller blinds. Illumination is plentiful, with a skylight in the cab roof. For night-times, LED task lights set in the underside of the lockers and the base of the drop-down bed are paired with over-locker ambient lighting. For fans of the small screen, a TV bracket slides out from the locker above the fridge/freezer. The ‘media wall’, located next to the entrance door, has a recessed storage cubby for a tablet computer plus a USB connection. At mealtimes, five adults can fit around the table in comfort; add the false nearside seat, removed during transit, and this number rises to six. Three gas burners and a combination oven and grill all feature in the compact, L-shaped kitchen, as does a large fridge with separate freezer on the opposite side. UK buyers wanting a microwave can put one in the left-hand nearside overhead locker; a plug point is located on the locker’s underside. The kitchen works well if you keep things uncluttered. With the long hob close to the window, there’s good workspace available in the foreground. Close the hob’s glass lid and deploy the sink’s wooden infills to increase worktop further. An extractor fan above the sink clears cooking odours quickly, while a splash guard to the right of the hob prevents damage to the adjacent bulkhead. To its right is a small rail for tea towels, although the drop is restricted by its close proximity to the worktop. With one berth per seatbelt, the Adria Matrix Supreme 687 SBC is a bona-fide five-person motorhome. However, the berths’ configuration underlines this ’van’s status as one for couples with occasional guests rather than a family tourer. The bedroom at the rear is based around a comfortable island bed raised off the floor to give generous headroom in the garage beneath. This space has a pleasing ambience. A pair of side windows and a rooflight keep the area bright during the day; over-locker lighting and a pair of spotlights cater for night-time reading. Another double bed is located at the front. It’s an electrically operated unit that lowers from the roof quickly and relatively quietly. Cargo nets are fitted to stop occupants from falling out at night. Underneath, a relatively wide single berth can be made up by dropping the lounge table, sliding a bed support out from the offside single sofa, adding an infill cushion and rearranging the seat squabs and backrests. The midships washroom with central vanity unit is one of the unique selling points of the 687 SBC, and is one of several ’vans to carry it this season, such as the Chausson Welcome 728 EB and the Roller Team T-Line 740. The washroom is clever for two reasons. You can close it off from the front and from the rear at the same time – essential when other people are using the beds in the lounge. The location of the washroom means that occupants from both ends of the ’van won’t disturb each other during night-time visits to the toilet. The shower-room door, which you open to close off the bedroom, plus a pair of sliding doors, section off these areas. In the middle of the washroom, on the bulkhead at the foot of the bed, is a vanity unit with half-length mirror and basin. Two task lights above illuminate this area. The shower room sited to its left has a mixer tap, a step courtesy of a wheel arch and double drain holes. Opposite the shower, on the nearside, is an electric-flush cassette toilet. In a considered piece of design, a cushioned flap rests on the loo seat to offer somewhere to sit after showering. This washroom is a tour de force, with ample space and privacy for users. There’s ample space for touring essentials and a generous 543kg payload to play with. Throughout the ’van are eight overhead lockers, in addition to two wardrobes in the bedroom. The kitchen has two large drawers under the sink, and there’s a small cupboard under the travel seat bench. Corner cubbies and a locker perch above the driver’s cab. The rear garage will delight those with rafts of leisure equipment; it can be loaded from both sides through large doors. Tie-downs are fitted to tether large items while on the road. On the roof’s rear section, roofbars can be added to the optional roof rails to transport bulky items. Inside the ’van, three cubbyholes in the double floor will keep valuables out of sight. The one to the right of the vanity unit is the largest. Space under the double bed is accessed via the split mattress. Buyers won’t want for much in the Adria Matrix Supreme 687 SBC. Alongside the host of driving aids in the base vehicle is a selection of high-end kit. Alde wet central and water heating, which can also be operated remotely by the optional Alde Smart Control, tops the list. LED lights feature all over the 687 SBC, there’s a smart touchscreen control panel plus a motorised hanging rail for clothes under the island bed. Touring couples will also love the 150-litre fridge with separate freezer, which will allow plenty of miles to be covered in between replenishment stops. The Adria Matrix Supreme 687 SBC is a luxury tourer for those who prize their comfort on the road, but with an MTPLM of 3800kg, younger drivers will need a B+C1 licence to be able to drive it. Adria’s conversion is as high quality as the excellent base vehicle it rides on. An opulent bedroom and great washroom complement the spacious front lounge. There are only some small negatives: the offside habitation door and the pronounced rear overhang. The kitchen, while well equipped, is a tad small for more than a couple. For £60,090, this is a lot of motorhome for the money. You get the comfort levels of an A-class for low-profile money. And to see other Adria motorhomes for sale, click here.